Extra virgin olive oil is to be the dominant fat on the TQI Diet. Some people hesitate to follow this fully, having been told that EVOO is too fragile to cook with and is no healthier than various high oleic oils that are quite heat tolerant. Increasingly Coop delis, “healthy” snack food manufacturers, and the food industry generally are using these new high oleic oils. High oleic oils are touted as better for us because they have more oleic acid and less of the more fragile essential (linoleic) fats than EVOO has. In reality, food preparers and manufacturers are switching to these oils because they are much less expensive and can move from the fridge to the stove to a deep fat fryer without changes in consistency or taste. I am leery of high oleic oils in part because they are made using genetically modified (GM) organisms and I am not satisfied with the safety studies done on the foods created using them. As well I am not convinced that, just because EVOO has a high oleic acid content, oils manipulated to have yet more oleic acid are yet healthier. We cannot automatically assume that because something is good, more is better. Instead, I look for foods that have long been part of the human diet. That history strongly indicates safety and benefit. 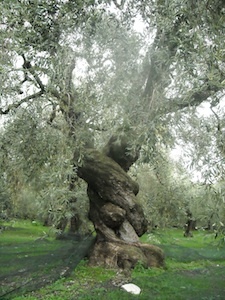 And there are many studies that show that EVOO, in the human diet for thousands of years, is a very healthy choice. In one such study scientists compared the DNA and antioxidant status of rats fed different diets. The control group was fed a typical lab rat diet. Others ate the base diet with either 15% GM soy, 30% EVOO, or 15% GM soy and 30% EVOO added. Compared to the control, rats fed GM soy had more damaged DNA, suggesting potential carcinogenic effects. They also had fewer antioxidants. Antioxidants are needed to maintain health. In contrast, rats fed a diet with added EVOO had less DNA damage, suggesting a potential anti-carcinogenic effect and more antioxidants – an overall positive effect. Finally, the rats fed GM soy with extra EVOO gained some protection against both the DNA damage and the lowered antioxidant status of those eating GM soy alone. It suggests that GM foods may have negative health effects because the DNA damage seen can eventually lead to cancer. However, given that the base diet did not include 15% non-GM soy for comparison, we do not know whether the damage was caused by the GM aspect or the soy itself. The study confirms the antioxidant power of EVOO and suggests EVOO can prevent DNA damage, and thereby prevent cancers from forming. The study also suggests that EVOO can help offset some of the potential negative effects of DNA-damaging foods. This suggests that if we choose to eat GM foods, making sure that EVOO is in the picture might be a very good protective move, just in case. Finally, the positive effects of EVOO were attributed to unique EVOO phenols, not to its oleic acid content. This puts in question claims that high oleic oils are a good replacement, given that high oleic oils do not have the unique phenols found in EVOO. And any phenols high oleic oils might once have had would be destroyed in the refining process they are all subjected to. Another study compared the cardiovascular benefits of EVOO with a high oleic sunflower oil and various refined olive oils. Only EVOO had positive effects on the test animals. The study concluded that EVOO’s fatty acid profile and its rich antioxidant content were both key to its health benefits. “When any one of these factors is modified, the effect of the lipid source on health could be negative.” Of course, both factors are modified in high oleic oils. EVOO has a long history of use in the human diet. There are a wide variety of types and flavors that we can enjoy as part of our diet. EVOO has a long history of use and good proof that it is a healthy oil. We should not allow industrial fats to replace EVOO in our diet. We should not be fooled by claims that “new” and “improved” foods are better for us. Instead remember, not only is it not nice to fool Mother Nature, it is not wise to try to do so either. This entry was posted in antioxidants, Food and tagged antioxidant status, antioxidants, cancer, DNA damage, evoo, extra virgin olive oil, food, high oleic oils, oleic acid, polyphenols, refined oils. Bookmark the permalink. 5 Responses to Extra Virgin Olive or High Oleic Oil? What might be the benefits of grapeseed oil? Not exactly on point but still of interest. Most grapeseed oil is solvent extracted and very refined. Not a good choice. There are companies like Napa Valley Naturals who do a non-chemically extracted grapeseed oil. So if you are using grapeseed oil, you definitely want it to be well made. Also of concern, however is that grapeseed oil has a 6:3 ratio of about 700:1 compared to olive oil’s more neutral 10:1. Finally, while there is quite a bit of research on beneficial compounds found in grape seeds, I know of no research showing that those compounds end up in the oil. In contrast, a lot of research on the antioxidant content of EVOO. So, I recommend that EVOO remain the dominant oil. I’m curious about your take on avocado oil and/or coconut oil as an alternative to EVVO for cooking. Both of these have significantly higher smoke-points than olive oil, allowing for safe oven roasting and higher-heat sauteeing. Neither of these come from GM crops, neither are high oleic oils, and neither are highly processed (compared to EVVO). Ha! No deep frying. But definitely higher-heat sauteeing for stirfries and also roasting veggies in the oven. I was specifically wondering about avocado oil and coconut oil, because they seem like good alternatives to EVVO for those applications, especially since I was noticing that the EVVO *was* smoking. EVVO is still our go-to for salad dressings, dips, and anything cooked on low heat. Avocado oil also seems to work well for Asian-style stirfries where the olive oil doesn’t seem to taste right. Ditto for coconut oil and curries.